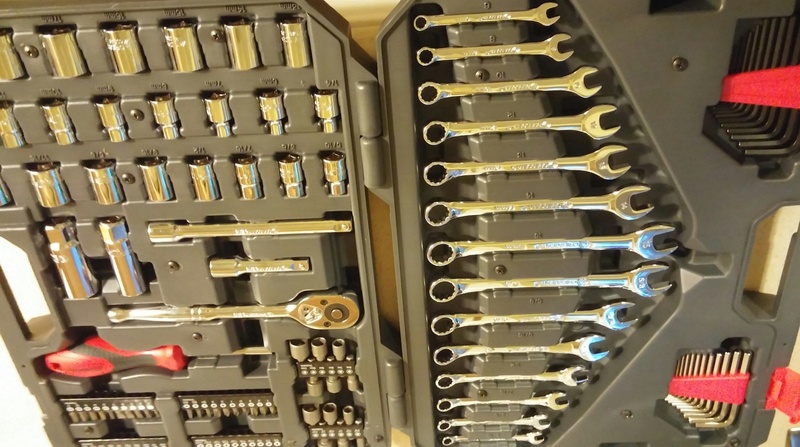 Yes, I’m posting a pic of my new tool set. I’m not a craftsman, handy man, or power tool junkie. I am usually one of those people who have made it through most of their life with nothing more than a hammer, a screwdriver, and maybe a wrench or two, and an Allen wrench but only because it came free with something that had to be assembled at one time. This tool set was free too! This year I celebrated my ten year anniversary with my company in which you get a cash award added to your check, a framed certificate for your cubicle wall, and a prize catalog from which you can pick a gift. It reminds me of those grade school candy sales where you got to pick a certain gift from a certain page based on how many boxes of candy you sold. I used to shoot for the minimum 8 boxes to get a stuffed animal or one of those Rubix Cube Snakes. Once I remember getting a camera that never worked. I got the catalog back in July, and yes, I waited that long to pick a gift. I had things to choose from like watches, jewelry, a new cutlery set, a tent, steak knives, a coffee pot, a pressure cooker, a leveler, sawhorses, a lamp, a CD player… a bunch of nice things that I don’t really need. So… I went with the tool set.